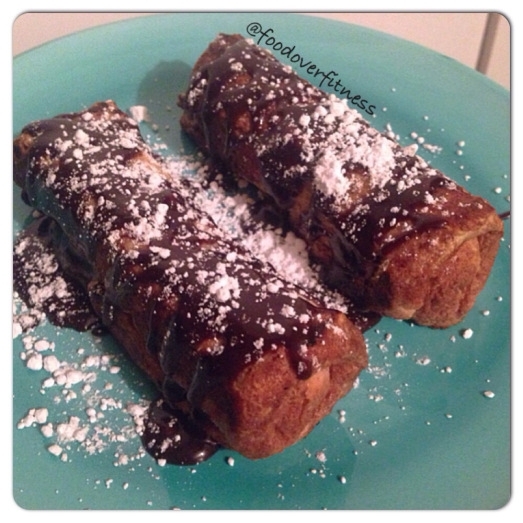 My take on a churro using a combination between cellucor protein powder, french toast, and quest bars! Can be made with any quest bar for the filling. Eat it while it is still warm and gooey on the inside! 3.Take slices of bread and roll them out until they are flat. Take half of the melted quest bar and put it on one side of the bread. Repeat on other slice. Take the end with the mixture and roll it up. Place toothpicks to hold in place. Coat bread in egg mixture. Place in greased pan and cook bread until crunchy. For the toppings, it depends on my carbs for the day. In the picture, I used a small amount of Nutella and powdered sugar. I have also mixed cellucor cinnamon whey with splenda and rolled the churros in that.